In my last blog post I demonstrated how a hyperlink can overcome the limitation of states in Captivate, not allowing to add interactive objects to states. 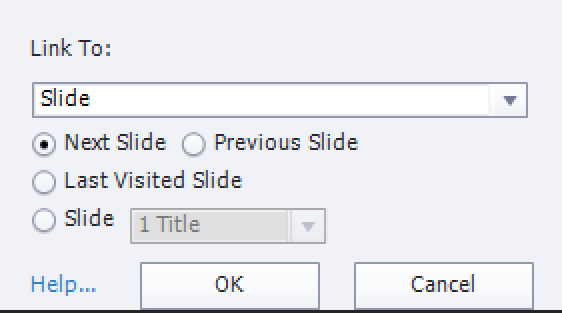 In older versions of Captivate the widget 'Go to Slide' was available: a dropdown menu with slide names, useful to jump to those slides. That widget has disappeared, is not replaced by a Learning interaction (compatible with HTML5). Although this widget can be reproduced, using the Dropdown interaction, that solution has several drawbacks. 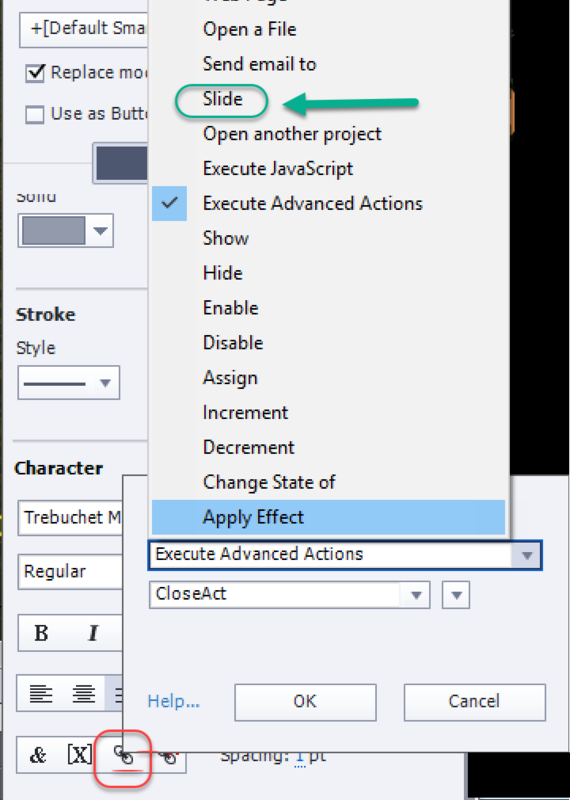 The formatting of the interaction is limited (maximum font size is 14pt), and you would need a variable and a conditional advanced action with as many decisions as you have slides in the dropdown list. A much easier solution can be found in this article, using hyperlink events. For a consistent behavior of the dropdown effect, I also used Micronavigation. 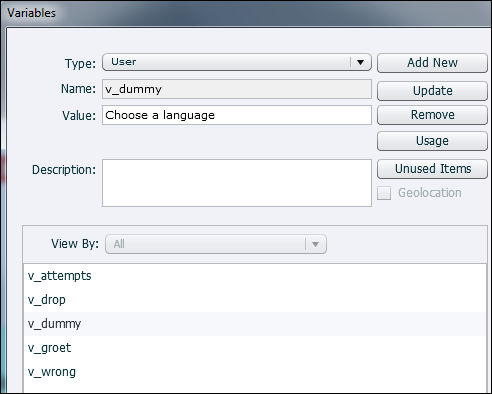 The list with commands, opening the dropdown list in the Hyperlink dialog box is much shorter than the list with simple actions under the Actions tab. Of course the Web page is the first command, since that is what you expect to happen with a hyperlink. State commands: Go to Next State/Go to Previous State cannot be done by advanced action, Go to State is possible. Watch the movie: after the title slide the dropdown menu 'Go To' appears. When you click on that shape button, another shape wlll drop down. It has 6 hyperlinks, I left them underlined to emphasize their type. When clicking on a hyperlink you'll be navigated to another slide which has a Back button to return to the Menu slide. The content slides are about the same subject as the previous blog post about popups and Close button. Of course it would be possible to have multiple slides in each 'chapter', and have only selected slides in the dropdown list. 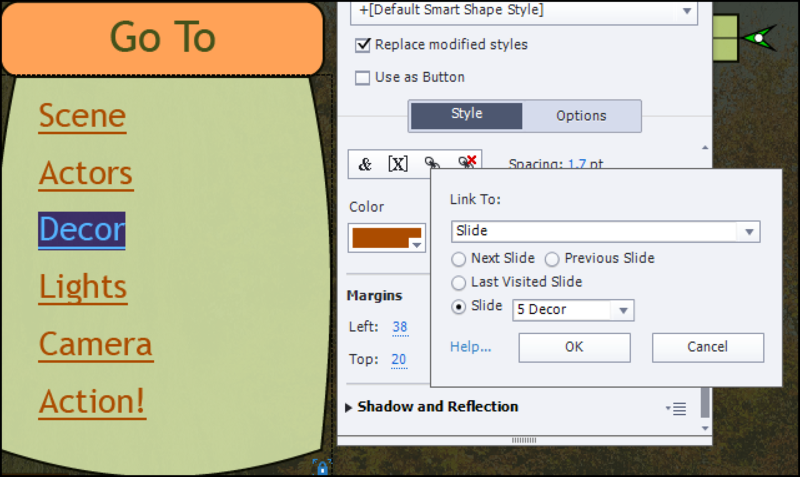 The shape button SB_Menu (Caption 'Go To') is on top of the originally hidden Smart Shape SS_DropDown, and pauses at 2,6 secs, after all effects have been accomplished. To mimick the behavior of a dropdown the Effect 'Stretch From Top' is applied to that shape. The effect starts at time 0 and has a duration of 1 sec. The arrow shape ArrowGoTo has some explanation and the effect EaseInFromLeft is applied. The second arrow ArrowDropDown has a similar effect, starting bit later, but that shape is not visible until the button SB_Menu is clicked. One user variable was created: v_start. It will be used to store the frame number of the first frame of the slide with the dropdown menu. I learned from experience that effects are much more consistent when you use micronavigation instead of applying the effect by an advanced action. The content of the variable will be used to send the playhead back to the first frame of the slide, to have the time-based effect being played. This action will hide the arrow shape ArrowGoTo, show the shape SS_DropDown and its arrow ArrowDropdown and return the playhead to the first frame of the slide with the system variable cpGotoFrameAndResume which has 'Continue' built in. That way the effects for the dropdown menu and the arrow with explanation will appear as they are timed from the start of the slide. Recently I published some tips about learning interactions, including an explanatory table. The use case in that post showed how to use checkbox and radiobutton interactions. Last week, a user asked a question about the dropdown interaction, which he used for a custom question slide: How can I check if the user has chosen an item? That is not difficult for checkbox and radiobutton, because their associated variable will be empty, but the situation is different for the dropdown interaction, hence this tutorial. there is no way of jumping out of the action when a correct condition is met. In the use case from the example movie, that sequence behavior is very important! the first sentence mentions 'combobox' but as I understand the word combobox this is not correct: in a combobox you can not only choose from a list but you can type in a word (there was an older combobox widget), this learning interaction doesn't allow that. Maybe you are bit puzzled by the first entry 'Choose a language'? Contrary to the radiobutton/checkbox interactions, the variable associated with a dropdown is never empty! By default it has a value equal to the first item in the list. 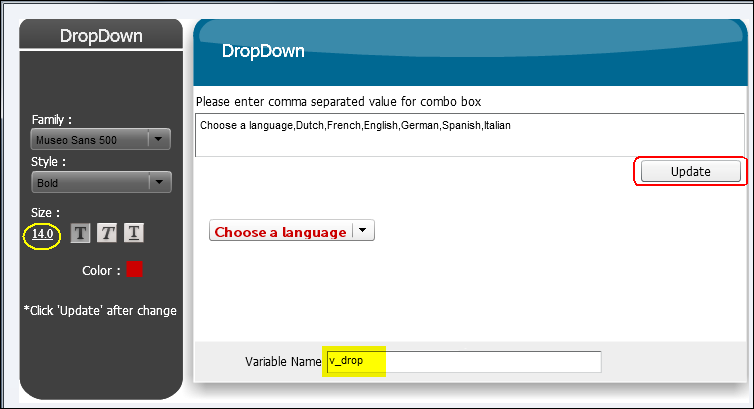 In the example movie, you will see before choosing, and after resetting that v_drop is equal to 'Choose a language'. Resetting: it is indeed possible since this latest version of Captivate not only to change the value of a variable by an action, but also to have this change reflected in the Display of the interaction. This new feature is used for the Clear button in the example movie. This movie has only 4 slides. After the 'Intro'-slide you can choose a language on slide 'Drop'. Watch the variable v_drop that is visible in a text caption next to the learning interaction. You get 3 attempts to guess the correct language, reason for the variable v_attempts. The 'Drop' slide has two interactive objects: Submit and Clear. Try out Clear to see how the interaction is reset to its initial state. You can click Submit without choosing a language, you can choose a wrong language or the correct one. The third slide you'll only see when your answer is correct. 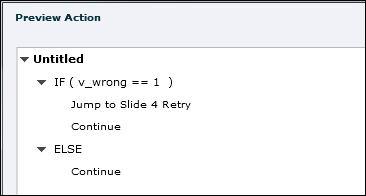 If you exhaust the three attempts without correct result, you will end up at the 4th slide 'Retry', where you are able to get back to the 'Drop' slide and start guessing again. As explained before v_attempts tracks the number of attempts and starts with value=3, v_drop is the associated variable for the dropdown interaction. I used v_dummy, a variable containing the text 'Choose a language' out of laziness, to avoid having to type that text over and over again. Be careful: it has to be exactly the text in the first item, it is not possible to use a variable in the item list. The variable v_groet is used on the third slide, to customize the text based on the current time of the user (cpInfoCurrentHour). The variable v_wrong is a Boolean (value=0) that will be set to 1 when the attempts are exhausted without finding the correct language. 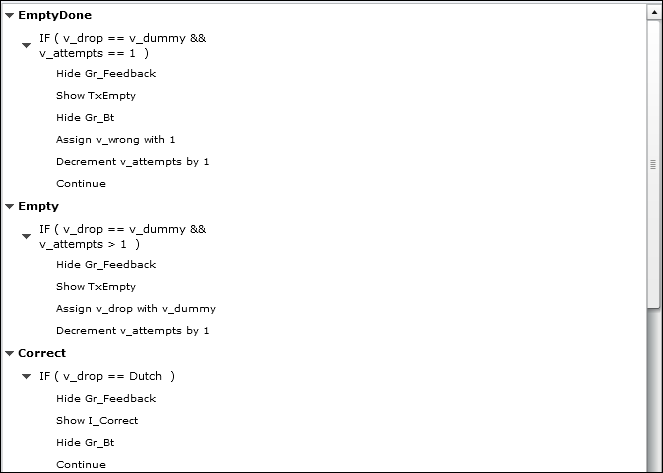 This standard action resets everything on the second slide 'Drop': the group Gr_Feedback with empty, wrong and correct feedback messages (empty, wrong, correct) is hidden, group Gr_Bt with the two interactive objects made visible, variables v_drop and v_wrong are reset to the default values. A standard action that restores v_drop to its default value and hides the group Gr_Feedback. The Sequence is important: if you put Empty before EmptyDone, it goes awry if it is the second attempt, because Empty would have decremented v_attempts and that means that EmptyDone would result also in a True condition, and user will lose an attempt. Same for WrongDone and Wrong, they cannot be switched. Exceptionally I use the On Exit event, because in this case it will function perfectly. A simple conditional action, based on the value of v_wrong. There is a simple Jump to slide 'Drop' on the last slide. Resetting will happen with EnterDrop action. The third slide has an On Enter action, to show the right caption based on the system variable cpInfoCurrentHour.